So last year when Eva and I were making our list and checking it twice, she said she was getting her mommy "green cereal" for Christmas. Oh yes, she assured me, mommy loves green cereal (Apple Jacks). And I took her out to buy and wrap some Apple Jacks, which it turned out Eva herself seemed to like a lot. So this year I asked her again what she'd like to buy mommy for Christmas. "Oh," she said, "it has to be really beautiful. Pookie! Take me to a very special place where I can buy mommy something beautiful, really, really, really, really beautiful, and very special for Christmas!" ...and took her to the most beautiful and really, really special place I know. She ate an entire cup of whipped cream, danced a ballet in front of a lady who works at the Columbia Ballet and colored a picture for Nana. 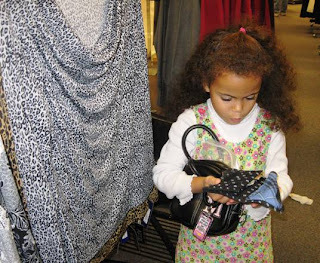 Of course, that wasn't what Eva had in mind, she wanted the most beautiful clothes, so we went clothes shopping. She picked several items to compare and then spotted this leopard print. Eva counted her money right then and there to see if she could afford it. We walked around the store, grabbing gorgeous items willy nilly and tossing them in our cart. We eventually pulled over and sorted through our cart. 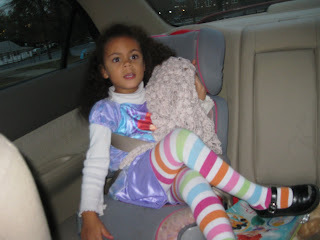 After careful consideration, she narrowed it down to one complete outfit. 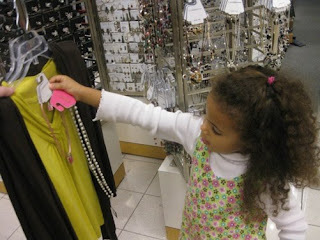 Then we had to go to the jewelry department to pick the right necklace to go with it. She took a lot of time picking the perfect necklace and we disagreed on it, so we bought two. My perfect and her perfect. 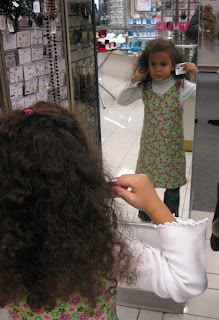 Then Eva got sidetracked by the beautiful earrings and had to pick out a pair for Aunt Marjorie. Again, she had to pick the perfect pair and she had to compare several pair in order to do this. Finally we had our selections and we went to check out. Eva's a smart shopper. It all fit inside her $2.00 budget. She couldn't believe it, what luck! I hope you all had a very Merry Christmas and got everything you ever wanted, especially a princess gown and wand. 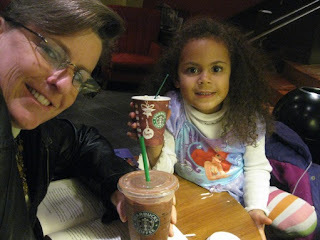 Nice to see that Eva has a bit of the Crocker shopping gene, balanced with the Maslar shopping budget gene. Way to go, Eva! Eva----You did a VERY nice job picking out this stuff for your Mama--She is 1 lucky lady!